When I got an email asking if we would like to review the latest Ben 10 DVD I could hardly say no, could I? You already know how much of a fan Mister A is - you remember the time he refused to call me Mummy referring to me as Ben 24/7 even when he woke in the night?! Hmmm well the Ben 10 that caused all that is back on the scene. Now I know what you're all thinking... the Omnitrix was destroyed in the last series when Ben 10 saved the universe (that was what you were thinking... right?) Well have no fear, there's a fabulous new hip space alien creator now - THE ULTIMATRIX!!! So.. what does this mean for you? Well, if you buy the DVD it means you gain instant appreciation from your children and you get 5 episodes worth of peace and quiet. Well, along with the new series there are new 'ultimate aliens' to be purchased and when your child stares up at you in the toy shop begging for the Ultimate Spider Monkey toy, you are going to struggle to say no. My suggestion would be - buy the DVD instead of an Easter egg then get the relies (that's relatives to you non-common folk) to buy a Ben 10 gift in place of the chocolate eggs that will drive your kids crazy with sugar. Mister A loves it - we watch it pretty much every day - including Mothers Day (twice). He loves it so we have to give a big thumbs up. Featuring 10 action packed episodes, the series is the third incarnation of the Cartoon Network franchise and follows 16-year-old Ben as he learns how to master the secrets of the mysterious new Ultimatrix, after his precious Omnitrix was destroyed last series. This brand new device not only allows him access to all of his previous aliens and powers, but also gives him the ability to evolve into super-strength versions of his alien entities - however, when things go ultimate, it is clear, so do the problems! The series kicks off with Ben’s identity being revealed to the world making him an overnight superstar. Distrusted by adults but hailed as a hero by kids, Ben 10 is forced to juggle his new found fame with battling alien threats to the galaxy. It’s a tough job, as he fights old enemies who want to track him down and threaten his family, while at the same time trying to save five fugitives from Aggregor’s power. The question is, does being older make Ben any wiser? 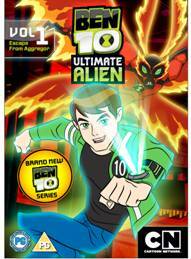 Catch up with all of the Ben 10 action when BEN 10: ULTIMATE ALIEN, VOLUME 1; ESCAPE FROM AGGREGOR is released on DVD on 18th April 2011.